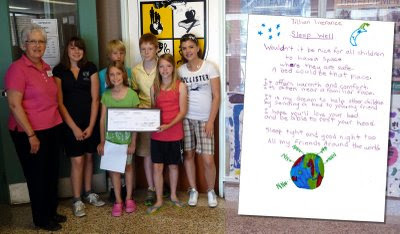 Students of Hepworth Central Elementary Public School held a blitz this spring to raise money for Sleeping Children Around the World. For their kick off, we did a presentation on our distribution in Togo in May 2008. Each classroom had a large coke bottle into which students put loose change from their own piggy banks or from a family donation. This small school of 360 students raised enough money in two weeks to purchase eighteen bedkits. The students loved the photos from TOGO which we showed to them and clearly they were motivated to bring money for this very worthwhile project. Congratulations Hepworth Central Elementary School.